SteelSeries offers the Arctis 3 Bluetooth headset for $129.99USD on their website and for that price, you really can’t get any better than that. SteelSeries already has the Arctis 3 gaming headset out on the market for folks to pick up at an inexpensive price of $79.99USD. 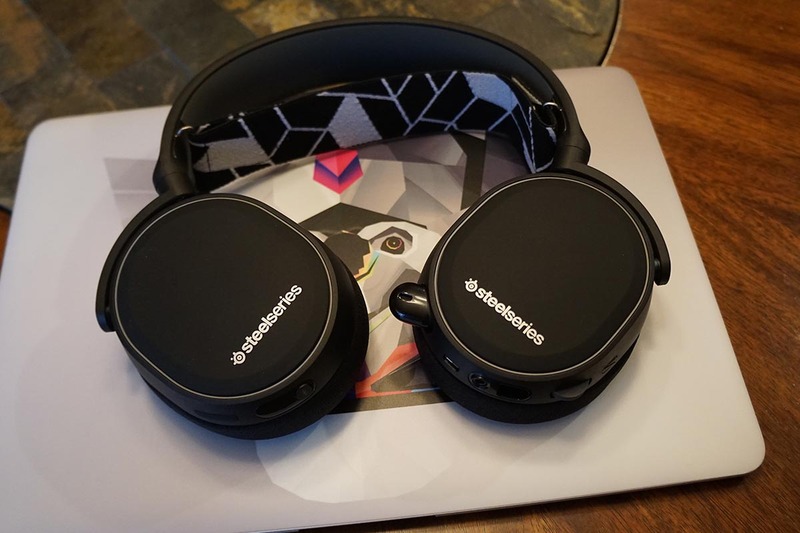 SteelSeries took that same headset and made it even better by adding in Bluetooth capabilities allowing you to use the headphones for Discord/Nintendo Online chat via BT, and the included 3.5mm jack to use with your gaming controller and listen to gaming audio at the same time. In this SteelSeries Arctis 3 Bluetooth review I’ll talk about how well they handle the double duty of Bluetooth and wired audio. 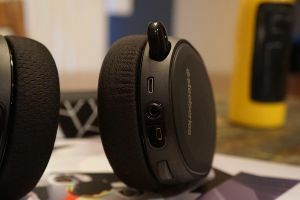 The SteelSeries Arctis 3 Bluetooth headset looks exactly like the Arctis 3 headset we’ve reviewed back in May this year but the only difference is this version has Bluetooth capabilities to it allowing you to take the headset wherever you want. You’ll still get the same hard matte plastic all around the headset, along with the rubberized gray piece underneath the band for comfort. 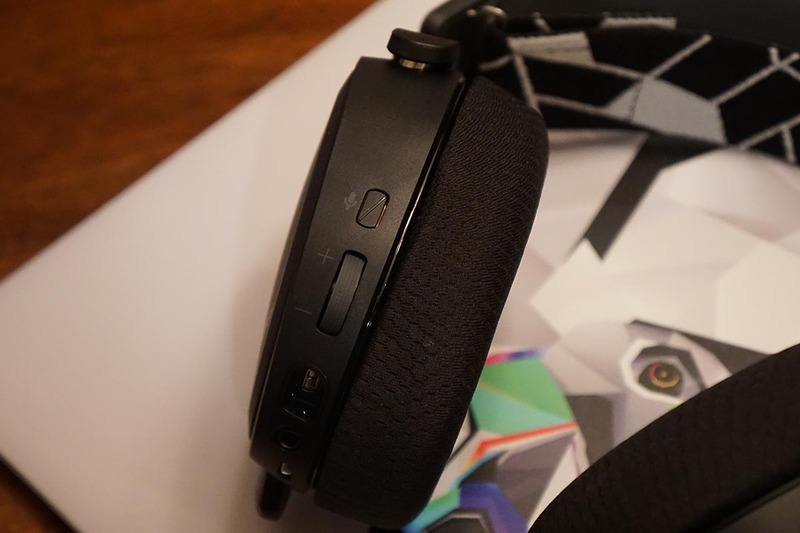 The Arctis 3 BT headsets from SteelSeries comes with a ski goggle headband that can be customized from the Velcro on the ends to best fit your head. On the inside of the earcups, you get a nice cushion that doesn’t have much discomfort after long usage time. Those same earcups do have the ability to rotate if you prefer the earcups a different way than most standard headsets. As for the outside of the earcups, the headset continues to offer the sturdy matte black plastic with SteelSeries logo on both outer earcups. There are controls and ports on the headset, but the majority of that will all be on the left-hand side. 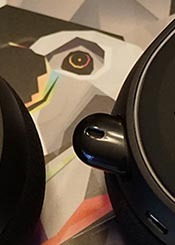 On the backside of the left earcup, you can see a mute/unmute button that pushes in and out and a volume rocker wheel. At the bottom is the mini USB port that works with the Y cable to let you use the headset with an Xbox, PlayStation, or PC. There is also a Micro USB port that will charge the headset for you, a 3.5mm jack so you can share what you’re listening to with others, and the slide out microphone. The right side of the headset has the power on and off/Bluetooth button. Inside the box, there will be an activation code to register your Arctis 3 headset to show up on the SteelSeries Engine application on a computer. This software will let you program your headset to better suit your sound needs. If you like 7.1 Virtual Surround, this software does come with it. Just hit the toggle switch to turn it on or off. From there you can still set your volume preferences from the equalizer, present sound options, and a bass booster. There will also be microphone adjustments too if you need them when playing games with friends on PC. 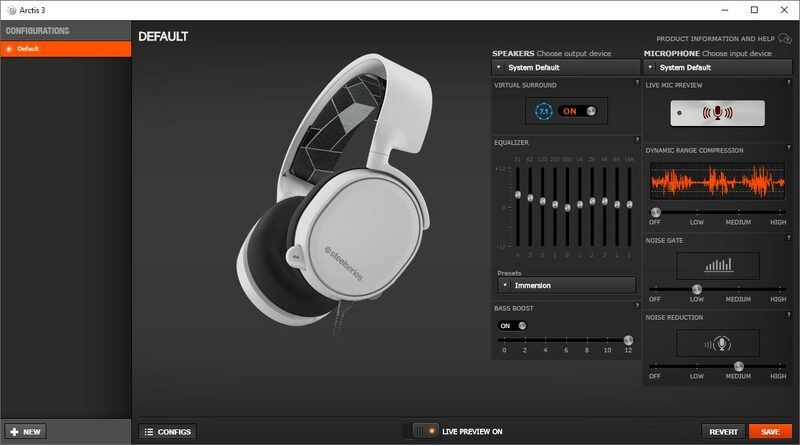 SteelSeries Engine 3 Arctis 3 configuration settings screenshot. The software itself is pretty simple to understand even if you don’t plan on changing any settings to the headset. Not many people use this but it’s still good to know that it will be there for you if you do need to enhance your sound preference. Even though this is a gaming headset more than an everyday use pair of headphones, it does well in the sound department but falls short of having some kind of bass. 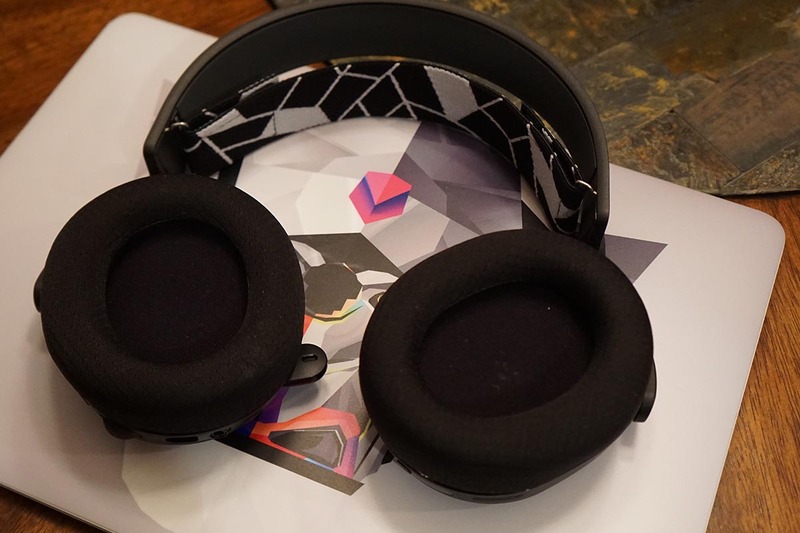 Every time I used the Arctis 3 Bluetooth I could hear everything going on around me in my games because of how crisp the sound was. It didn’t matter if I was playing games or listening to music/videos at any volume, there was no distortion or muffled sound. Adjusting the bass settings through the SteelSeries Engine software on PC will enhance the bass making it better, but it’ll only save those settings if you’re going to be running on PC the entire time. 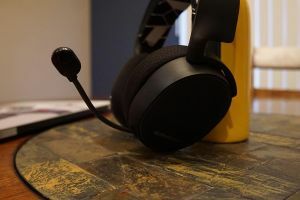 Microphone quality is something everyone looks for when they are browsing for a new headset for their favorite game console, so it’s only fair that companies make sure they are up to par with how well people can hear each other through the mics. I’ve tested the headset on multiple mobile devices, along with my Xbox and PS4 and everyone that was in the party was able to hear me well. When using the headset for mobile calls, I had to adjust the mic a few times so people could hear a bit better. It wasn’t too long before people were telling me they could hear me just fine. As with any headphones with a mic attached to them, people could hear what was going on in the background such as my keyboard typing, other people talking, or the dog going crazy. SteelSeries claims you can get 28 hours of active listening and while that is a lot of playback time, I probably got close to it from using the headset on the computer the majority of the time when playing games with others. Other use came when I was using the headset for phone calls and music. After the first charge, it took forever for the full battery (green light) to even reach close to half of battery life left (yellow) and then some time to reach low battery level (red). Considering the time it takes the battery to fully drain, I don’t expect people to dislike this headset because of how awesome battery life you can get. 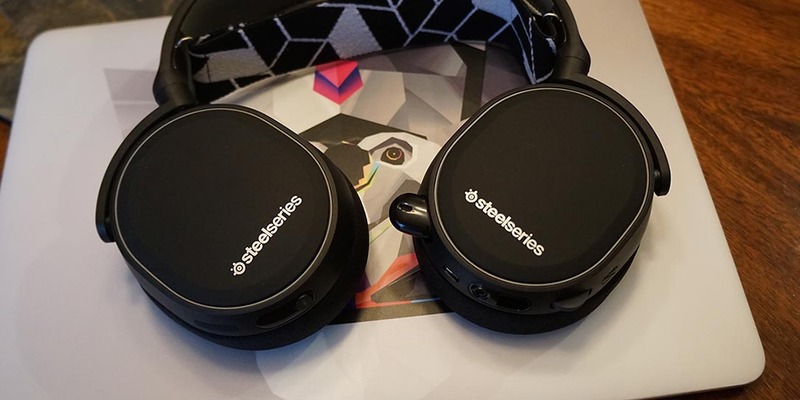 SteelSeries offers the Arctis 3 Bluetooth headset for $129.99USD on their website and for that price, you really can’t get any better than that. 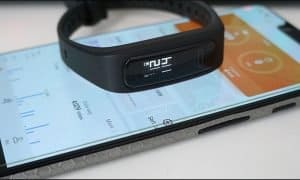 You’re getting Bluetooth capabilities for game chat from Discord or your phone while still being able to use the 3.5mm cable to listen to the games you’re playing on your favorite system. I really enjoyed reviewing the SteelSeries Arctis 3 Bluetooth headset and it gets a thumbs up in my book. 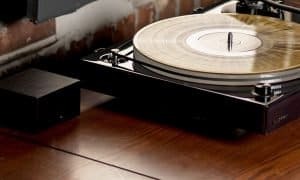 I believe the way SteelSeries added the ability to listen to game audio through a cable and use Bluetooth for phone calls, music, or chatting with friends, other headphone makers may end up coming out with their own way to handle both simultaneously. 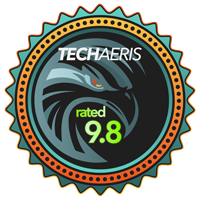 *We were sent a review sample of the SteelSeries Arctis 3 Bluetooth headset for the purposes of this review.